Cupping is a method in which a jar / cup is sucked to the skin surface to cause local congestion. Practitioners can use fire to heat the glass cup, or boiled bamboo cups. Plastic cups with vacuum gun are also very popular, often used in the modern clinic and home. They all create negative pressure inside cups before the cups are placed on the skin. After the skin is sucked up, patient can feel tightness around cup area. Then the cup is left for a while (5-15minutes), it can cause congestion and leave marks / rings around treatment area. Usually, these marks can last up to one week. The colour of marks also shows the level of stagnation. The dark, purplish rings with scattered black spots usually indicate severe stagnation deep inside body. In Chinese medicine, pain indicates stagnation due to circulation problems inside body. For example, an injury that tears muscles and tendons can lead to internal bleeding and cause blood stasis around the damage area. As the circulation is blocked, patient can immediately feel sharp pain while swelling occurs in the local area. Severe injuries will further lead to inflammation when the toxins cannot be removed quickly due to stagnation. After cupping, the toxins and stasis can be lifted to the superficial level while more blood is supplied towards congested area. Therefore, cupping serves to speed up the healing process after injury. It also can induce analgesic effect to stop pain at same time. With firing method during cupping, it warms the body to remove “wind”, cold and damp. It can further benefit other conditions, such as cold / flu, headache, rheumatic disorders and skin problems. 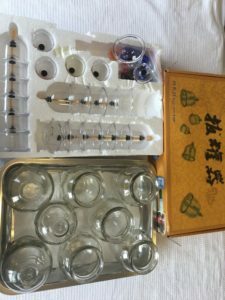 Modern clinics also use cupping as healthcare and prevention. Mobile cupping over the back to stimulate the channel system can help clients to improve the immune system as well as reducing both tension and stress if it is performed on regular basis.